In middle school, I was one of only two kids with red hair. There was a gorgeous, popular girl with long auburn hair that had fiery highlights, and then there was me: a short, skinny skater kid with hair that looked orange in the sun, and like fire engine indoors. I was an instant target for bullies, and as if on cue, they lined up to torture me and make my life miserable. Unfortunately, in the late ’80s and early ’90s, the common response to bullying was either to ignore it, saying, “boys will be boys,” or to rebuke the victim by insisting that being a “tattle-tale” was somehow worse than being a bully. Thankfully, attitudes have changed. We are moving toward a more just, kinder society, but there is still more that we can do. It could be a stranger, neighbor, or even your best friend. And it can be harmful. Physical bullying includes hitting, kicking, tripping, pinching, pushing, or other forms of violence, including damaging property. Verbal bullying includes name calling, insults, teasing, mocking, intimidation, homophobic or racist remarks, sexist remarks, or verbal abuse. While verbal bullying can start off harmless, it can escalate to levels which start affecting the individual target. Negative facial or physical gestures, menacing or contemptuous looks. Playing nasty jokes to embarrass and humiliate. Encouraging the social exclusion or “leaving out” of someone. 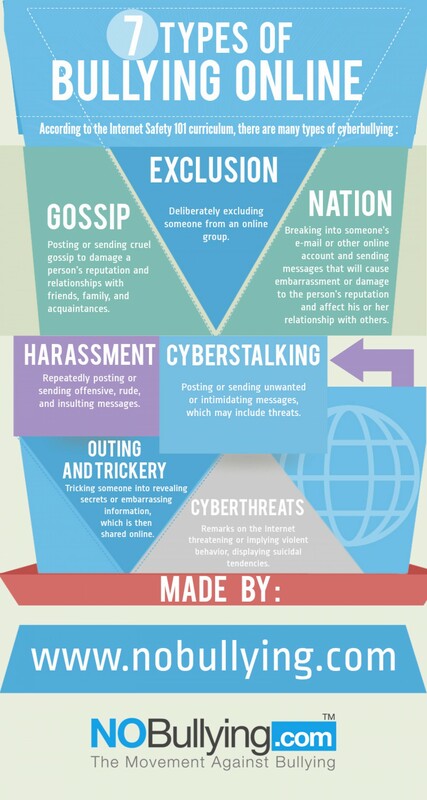 Cyberbullying is overt or covert bullying behaviors using digital technologies, including hardware such as computers and smartphones, and software such as social media, instant messaging, texts, websites and other online platforms. Imitating others online or using their log-in. No matter where you are, bullying can happen, and if not monitored, it can escalate quickly. Even though not all children exhibit warning signs, there are telltale indicators that could be going on. There could be unexplained injuries, destroyed property, faking illness, difficulty sleeping, loss of interest in school, changes in eating habits, loss of friends or avoidance of social situations, feelings of helplessness, and self-destructive behaviors. Kids may be bullying others if they are violent, friends with other bullies, blame others, are competitive, have unexplained extra money or items, get sent to the principal's office frequently, and don’t take responsibility for their actions. Be on the lookout for these warning signs and call for help if someone you know are having self-destructive behaviors, such as self harm and suicide. Although some may be listed, more can take effect, such as symptoms of anxiety, feelings of shame, social isolation, psychosomatic symptoms (physical ailments with no medical cause) and even bedwetting. But long-term effects can soon escalate. Bullied victims face the reality of having depression, PTSD, substance abuse, poor general health, and even suicidal thoughts. For the bully, he or she may have poor school performance, increased truancy risk, substance abuse, and maybe even child abuse at home. A lack of education and employment is also a strong long-term effect. - Help kids understand bullying. Talk about what bullying is and how to stand up to it safely. Tell kids bullying is unacceptable. Make sure kids know how to get help. - Keep the lines of communication open. Check in with kids often. Listen to them. Know their friends, ask about school, and understand their concerns. - Encourage kids to do what they love. Special activities, interests, and hobbies can boost confidence, help kids make friends, and protect them from bullying behavior. - Model how to treat others with kindness and respect. Get police or medical attention if a weapon is in use, there are serious threats, hate-motivated violence (homophobic or racist), bodily harm, or illegal acts are involved. In addition, making sure you intervene immediately, separating the kids involved, making sure everyone is safe, reassuring the kids, and model respectful behavior is vital when approaching bullies. Avoid the common mistakes of ignoring it, sorting out the facts, forcing testimonies, questioning in front of a group of people, talking to the kids together, and forcing apologies on the spot. The important thing is to not become a bystander. Action is the best resolution when it comes to bullying. As a bystander, you can question the behavior, redirect the conversation, come in a group, walk with the person being bullied, and reach out privately and check in on the person. 1.) Talk to your fellow friends. 2.) 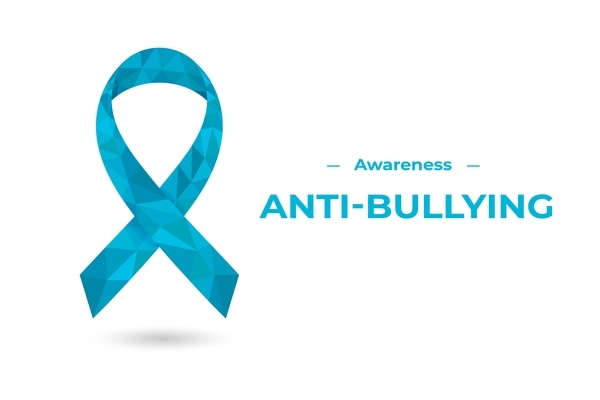 Volunteer with organizations that promote anti-bullying. 4.) Start a local initiative! Make a difference in your community. 5.) Get ready for October, which is National Bullying Prevention Month. Activities occur every week during October that many schools use to offer awareness and prevention. 6.) You could even show support year-round by wearing a custom-made anti-bullying wristband made by yours truly. Go to rapidwristbands.com and order yours today! Luckily, I survived my long years of bullying pretty much intact. I have suffered a few of the long-term effects, such as finding it hard to trust people, and aversion to groups of people I don’t know or trust, but I have largely turned my negative experience into a positive empathy and passion to see that no one has to suffer the way I did. Please do your part to stop bullying in its tracks.